Sitemagic CMS is a modular Content Management System. All features in Sitemagic CMS are individual extensions that together make up the entire system. Extensions are installed in the extensions folder on the server. Additional extensions can be installed to this folder as well. Before an extension can be used, it must first be enabled under Admin > Settings - make sure you are logged in first. To enable an extension, simply check the checkbox next to the title of the extension, and click Save. 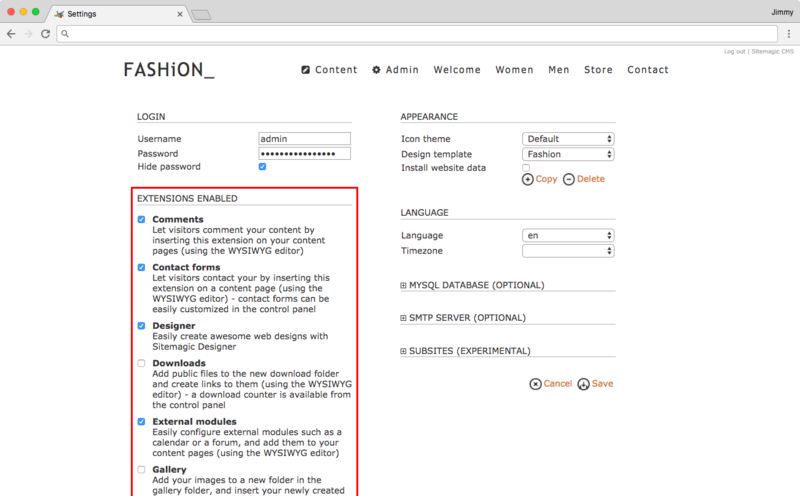 Some extensions add an entry to the Content menu, some to the Admin menu, others add a Page Extension that can be inserted into a page using the Page Editor. Use the menu on this website to learn how to work with the different types of extensions in Sitemagic CMS.